Hoaxes are meant to fool the world—and some people fall for them. Would you? Crop circles. Aliens on earth. Fairies caught on film. Giant cats. What do these phenomena have in common? They are all hoaxes. 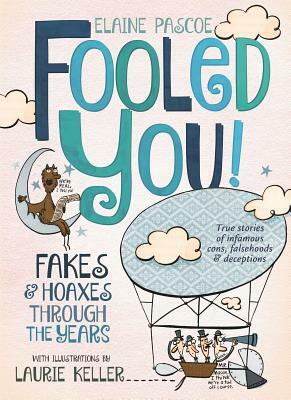 Elaine Pascoe presents well-researched chapters on nearly a dozen infamous hoaxes—from the 1800s to the present—exploring the stories behind them (how they came to be as well as who instigated them) and pondering why people were so easily fooled. These tantalizing accounts hold tremendous appeal for all ages and are as much about the craftiness of perpetrators as about the gullibility of believers. Would you have been fooled? You'll just have to read Fooled You! to find out. With fun illustrations but Laurie Keller, author and illustrator of Arnie, the Doughnut, Fooled You! : Fakes and Hoaxes Through the Years is a fun, funny nonfiction book for the chapter book set. Elaine Pascoe has written more than twenty nonfiction books for young readers and has worked as a newspaper reporter, magazine writer, and editor. She lives in Connecticut.